Hawaii's most expensive beach home is priced at $70 million and featured this week at TopTenRealEstateDeals.com. The most expensive home for sale in Hawaii is priced at $70 million. Kauai’s 15-acre Hale ‘Ae Kai estate, with postcard views of the ocean and nearby lighthouse and private steps down to Secret Beach, is the most expensive home for sale in Hawaii at $70 million. Representative of the perfect tropical island, Kauai has attracted many film and television producers who have made over 70 films there including "Donovan’s Reef," "Blue Hawaii," "Jurassic World," "The Thorn Birds" and the pilot and first episode of "Gilligan's Island." Part of the mansion’s lushly planted acreage is devoted to a working farm of coconuts, bananas, white pineapple and citrus trees. 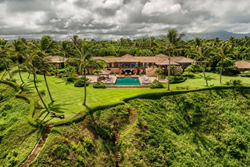 Built and owned by a former co-chief executive of Morgan Stanley's operations in the Asia-Pacific region, the 11,708-square-foot house is made up of Balinese-style pavilions on a bluff overlooking the Pacific Ocean and Kilauea Lighthouse. Constructed with wood-beamed vaulted ceilings, walls of glass and stone, it includes a two-story main pavilion, covered lanais and two guest pavilions with a total of four bedrooms and six baths. The main living area in the central pavilion is on the upper floor with living and dining rooms, a large chef’s kitchen, office and bedroom suite. The lower level has a media room, full bath, gym and a bar opening to a 1,600-square-foot pool and spa. The master suite is over 1,000 square feet and, in addition to the bedroom, has a living room and bar with the bath having both indoor and outdoor shower, lanai and large dressing room. The two guest pavilions feature king-sized beds, bar and refrigerator, full baths and lanais. The farm manager/caretaker’s two-bedroom, two-bath residence is nearby and surrounding farmland acts as a barrier between the gated compound and other development. Kauai, alternatively known as the Garden Isle, is geologically the oldest of the chain of main Hawaiian islands. Of the eight main islands, Niihau, Kauai, Oahu, Maui, Molokai, Lanai, Kahoolawe and the Big Island of Hawaii, Kauai has always attracted people who enjoy lush vegetation, fresh organic foods, hiking through the Moloaa Forest Reserve and all manner of outdoor activities. When the Strong family are not in residence, they lease the property as a luxury vacation rental for $10,000 a night. Hale ‘Ae Kai is listed for $70 million by Neal Norman of Hawaii Life Real Estate Brokers.